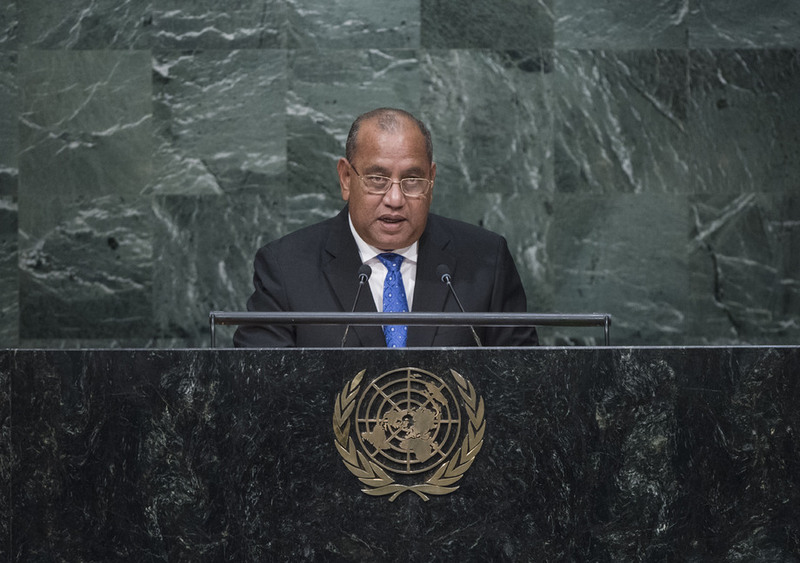 CHRISTOPHER J. LOEAK, President of the Marshall Islands, welcomed the adoption of the 2030 Agenda, but noted that his country could not afford a “set it and forget it” mentality, which had too often marked past international efforts. His Government had a powerful window to merge recent national planning improvements and set up architecture to measure progress and pinpoint gaps. “These gaps are not only our own, but also those of our partners,” he said, stressing the need for accountability for collective performance. He also welcomed the establishment of a comprehensive assistance programme with the International Atomic Energy Agency (IAEA) aiming at building national capacity to monitor and evaluate nuclear contamination and address health strategies and other key sustainable development goals benchmarks. As a low-lying island nation, with no higher ground, climate change posed a severe threat to its very security, he said. The future of his nation was perhaps more in the hands of his fellow world leaders than it was his own. He refused the very notion that his country would willingly relocate to another nation, and the notion that “if the water comes, it comes”. Recalling that the Pacific islands region served as a horrific theatre for a global power struggle in an earlier age, he said that decades later, the region was facing again the complex push and pull of larger international politics while expressing support for New Zealand’s initiative during its Security Council presidency in holding a meeting on small island developing States and threats to international peace and security. That meeting revealed issues that slipped under the global radar. The Council should establish a regular agenda on security issues in those small island nations. His country, like many others, believed that the awareness of the catastrophic impacts and humanitarian consequences of nuclear weapons must underpin efforts toward nuclear disarmament. As a former United Nations trust territory, his country had a unique legacy shared by a few other nations — 67 nuclear tests were conducted in his nation by its former administrator, the United States. He urged the Secretary-General not to omit the powerful example of his nation when encouraging progress on nuclear disarmament and test-bans. It was essential for the survival of humanity that nuclear weapons were never used again, under any circumstances.